When school leaders think about teachers they may like to think their perspective (the perspective of a school leader) would be fair and accurate. My experience in understanding how people “think together” suggests that thinking interdependently requires truly seeking first to understand, as Stephen R. Covey in The 7 Habits of Highly Effective People challenges us to do. This means deeply listening to and not arguing and instead probing to understand further. Follow this hyperlink to an article an ex-teacher wrote. 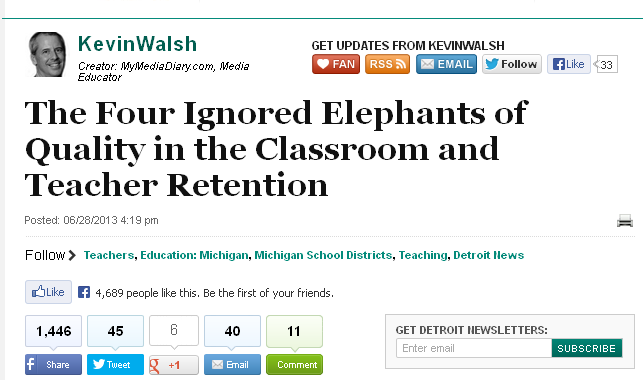 Kevin Walsh brings up what he calls, “four ignored elephants of quality in the classroom”. I ask that you read the Huffington Post article. And that you consider his points. Might you want to have conversations with others in education (school board members, teachers, parents etc.) about the four “elephants” he identifies? As you have these conversation – consider probing and paraphrasing to show you understand the point of view being shared. My belief is that understandings can lead to collaboration, cooperation, idea generation and/or interdependence. As we work to serve the learning needs of all children collaboration, cooperation, idea generation and/or interdependence will definitely be needed!!! !